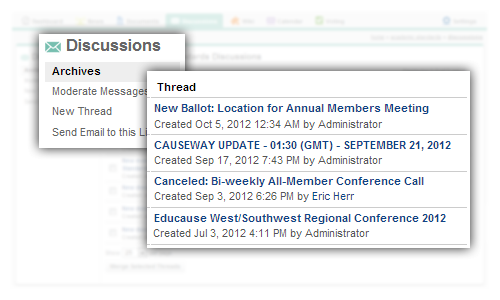 Every committee has its own email list, and the Discussions area provides an easy online interface for those choosing to participate or review email archives through the web. Additional stand-alone lists can be created, and subscribers do not need to have a Causeway account to participate. Participation can be limited to committee members, all association members, or open to the public, and moderators can easily approve/reject content before or after publication. Users have the option of sending a message to a workgroup's mailing list each time content is posted to alert the members of new documents, wiki pages, meetings, and more. Members can also use Causeway's search function to track down older emails, and results are only displayed from lists that the member has explicit permissions to access.